Effective immediately, the U.S. Bureau of Land Management has banned recreational shooting g on all BLM lands in San Diego’s East County and the South Coast areas for the remainder of fire season. Cal Fire Chief John Francois, in an e-mail sent to fire officials and community leaders across our region, stated that fire agencies now have the authority to enforce the restriction on shooting. “If you see anyone shooting, please contact your local law enforcement agency,” Chief Francois urged. August 6, 2013 (San Diego’s East County) – The Bureau of Land Management Desert Advisory Committee (DAC) will meet Saturday, Aug. 17 to consider a fee proposal for the Imperial Sand Dunes Recreation Area. The Council will meet from 1 p.m. to 4:30 p.m. at the Riverside Marriott Hotel, 3400 Market St., Riverside, CA 92501. The meeting is open to the public. However, discussion is limited to BLM staff and committee members. Secretaries of Interior and Energy invited to showing of "Who Are My People?" August 6, 2013 (Las Vegas) – It is no coincidence that the Las Vegas premiere of “Who Are My People?” is on August 13. National Clean Energy Summit 6.0 takes place the same day. September 8, 2012 (San Diego)—There was tension in the air as the two legal teams got ready to present their case before District Judge William Q. Hayes. Community Advocates for Renewable Energy Stewardship (CARES) lawyer, William Pate, observed, “This case is not about energy policies or government programs, it’s about the rule of law.” Pate argued that the government has to be ruled by laws, and that “it is no more complicated than that.” He also argued that government agencies, in this case the Bureau of Land Management, are run by people and that people make mistakes. 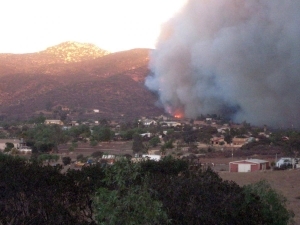 July 22, 2012 (San Diego’s East County) – Revelations that six wildfires in the past six weeks have been caused by recreational shooting in East County has caused a firestorm of controversy. Cal-Fire, joined by residents of Dulzura, Potrero and other areas bordering the Otay Wilderness area have asked the federal Bureau of Land Management to ban shooting on its properties within San Diego County for the duration of this year’s expected severe fire season. 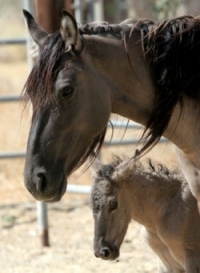 June 24, 2012 (San Diego)--Cleveland National Forest (CNF) and the Bureau of Land Management (BLM) have released an Environmental Assessment (EA) for feral pig management on public lands in San Diego, Riverside and Orange Counties, as well as on the Capitan Grande Indian Reservation. Feral pigs, which are not native to our region, have caused extensive damage by rooting that destroys riparian waterways, habitat and forage for wildlife. The plan includes 600,000 acres of public lands, including many in East County. June 24, 2012 (Washington D.C.) – A scathing new report by the U.S. Department of Interior’s Inspector General highlights “significant failures” by the federal Bureau of Land Managment in its stewardship over more than 30,000 wind energy right-of-way (ROW) acres and another 31,000 acres of solar energy ROW sites. View the complete report at http://docs.wind-watch.org/BLM-Renewable-Energy-Program.pdf. June 20, 2012 (Ocotillo) –A fourth lawsuit seeking to halt the Ocotillo Express wind facility has been filed in federal court. The plaintiff in this case, Community Advocates for Renewable Energy Stewardship, filed suit yesterday against Pattern Energy, the U.S. Department of the Interior, Bureau of Land Management and top government officials. The suit, which seeks a permanent enjoinment or halt to the project, differs from prior lawsuits filed by other groups on several fronts. 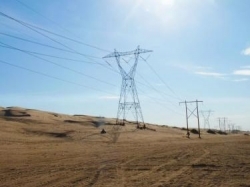 April 10, 2012 (Ocotillo)—At least three appeals have been filed over the Imperial County Planning Group’s approval of the Ocotillo Express wind project. The appeals seek to have the Imperial Valley Board of Supervisors review the decision. Appeals filed by yesterday’s deadline include the Viejas Band of Kumeyaay Indians, California Environmental Law Project, and Boulevard Planning Group Chair Donna Tisdale.